Son! All the Adhiparasakthi Weekly Worshipping Centers are My sub-temples. I am going to offer My Grace to the devotees who recite their prayers in these centers. Son, by participating in group prayers, your previous Karmas (fruits of your actions) will be consumed. You will receive Sakthi's grace. You will be relieved of your sorrows. Son, I am bound by two things. First Bhakthi (devotion). Second by your selfless services. The Adhiparasakthi weekly worshipping centers are the backbone of this movement. To establish Sakthi movement and remove the grievances of people AMMA ordained the establishment of these weekly worship centers. They are called Adhiparasakthi Vara Vazhipaatu Mandrams(weekly worship centers). These mandrams are affiliated to the Siddhar peetam and its trust. The objective of these mandrams is to develop devotion and duty. The first and foremost duty of every mandram is to conduct a mass prayer once in a week before AMMA'S portrait for the upliftment of human race. The prayers are to be conducted according to the Sakthi tradition set up by the oracles of AMMA uttered from time to time. 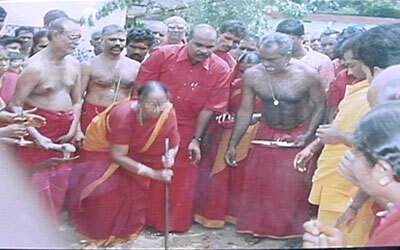 In these mandrams , the red clad devotees, both men and women take part in the weekly mass prayer. Apart from this the main activity of all the Adhiparasakthi mandrams is selfless service to the welfare of society at large. More than 3,000 mandrams have been set up and are functioning all over India and other places in the world like USA, UK, Malaysia, Singapore and France. In Dharmapuri, with the blessings of AMMA the weekly worship center was started in the year 1982 and since then the devotees are involved in weekly mass prayer and numerous social services in their region. Conducting Mass prayers on every week, on every full and new moon day and on all festival days. Conducting yagna and kalasa - poojas in the homes of distressed families to alleviate suffering. Distributing free food and clothing to the poor people. Donating books and clothes to the poor children and youth. Supporting the orphanage children and the blind school children at Dharmapuri. Currently the weekly worship center is functioning at Valluvar Nagar, Oddappatti, Dharmapuri. During Adigalar's holy trip to Dharmapuri district AMMA visited the Dharmapuri mandram on 31st March, 2001 and asked the devotees to start the Sakthi peetam temple construction at the place where the mandram is fuctioning. With the blessings of AMMA the foundation stone laying ceremony was held at Valluvar Nagar, Dharmapuri on 2nd September, 2001 and the foundation was laid by Adigalar's eldest son Sakthi. B. Anbazhagan. With the blessings of AMMA the mandram is now getting a new shape as Sakthi peetam temple. We now need your generous support and donations for the ongoing construction work.